VISUMATION provides best practice, forward thinking learning design capabilities. Most e-learning focusses on what Mr Bloom calls foundation thinking skills; remembering, understanding and applying. We turn Bloom’s taxonomy upside down and focus on those higher order thinking skills: analysis, synthesis and evaluation. We do this by using interactions that help to provide experiences; where learners must use those higher order thinking skills to make a decision or solve a problem. We then use tools to ‘backfill’ only if the learner requires it. So, if they need to make a decision, but are unsure of the correct information, help agents such as ‘Speak with your supervisor’, ‘Search the internet’, or similar, provide a realistic approach to filling in the blanks, just like we can in real life! 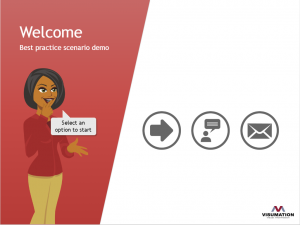 If you would like to see how we make learning more of an experience, then take a look at our demo.